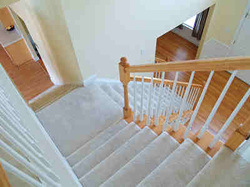 Carpeted stairs are the section of your home that get the most dirty, as you are constantly walking up and down them. Whether you are barefoot or in shoes, walking on your carpets will undoubtedly get them dirty. If you walk on your stairs with your shoes, you will be getting your carpets dirty. The mud, dirt, grass, and gravel from your shoes will get stuck in your carpet. When you step on the carpet, you are also pushing the dirt and mud further down into the carpet fibers which in turn makes it more difficult to get out. A regular vacuum might get the dirt and dust off of the surface, but you still might have dust or residue further down towards the base of the carpet. Having a professional who has high tech and heavy duty cleaning machinery will help you get the cleanest carpets you can possibly get. Even if you do not walk on your carpet in shoes, your bare feet can cause the carpets of your stairs to get dirty, also. Just the dead skin off of your feet can get your carpet dirty, and dirt that you have on your skin can also rub off into the carpet. The best thing you can do is always wear clean socks on your carpets, or make sure that your feet are clean. If you take a shower and then walk on your carpeted stairs, you want to make sure that you are thoroughly dried off before you step on your carpet. If you are not dried off, you might be dripping water into your carpet. Water can seep into the carpet fibers very quickly, and water, if not properly dried, can cause mold and mildew to grow in your carpets. Water on your shoes can also be pressed into the carpet of your stairs. People are always moving about your home and walking up and down the stairs, so it makes sense that your carpet stairs get dirtier more quickly than everything else. It is probably the carpet in your home that is walked on the most, and all sorts of shoes and feet are constantly walking on it. Because so many people and pets walk up and down your stairs, you want to make sure your carpets are clean also for their safety. If you drop something sharp into your carpets, people run the risk of stepping on it. Even smaller things you might not think of or notice, like pebbles, bits of gravel, dirt, or rocks can come off of your shoes and become embedded in your carpets. When this happens, people in their bare feet can get injured and become hurt from stepping on the sharp items. You also run the risk of ruining your own vacuum if you use it on these sharper objects. Our equipment at Kingwood Carpet Cleaning Pros is of the highest quality and is built to be able to tackle large spills and large objects that might get stuck in your carpets. If people carry food and drink up and down the stairs, they might end up spilling it on your carpet. Carpets on the stairs can be difficult to clean because of the creases in between each step, so having us do the cleaning for you will not only be easier on you but will also ensure that your carpets get cleaner because we know how to clean the creases in between the steps. From Mount Houston, TX to our Office is only takes a 22 minutes car ride.